He was born into the land-owning classes in Athlone, Co. Westmeath, and was educated at Galway Grammar School and in Devon. During the 1890s he went to Paris where he studied at the Académie Julian under Jean-Paul Laurens, and also travelled through Italy, where he encountered the work of the Italian Symbolist painter Giovanni Segantini. He lived in Cornwall and showed his work in London with a range of groups including the Royal Academy and the New English Art Club. He was known mainly as a landscape painter but he also worked as an aillustrator for such books as Kenneth Grahame’s The Golden Age. The British Isles rank very high among foreign places represented in the Community Collection, with more than a dozen works. Likewise, landscapes in various media form a significant group. So Enraght Moony’s watercolor of a couple spending their afternoon in the fields of rural Cornwall may be one of its most typical pieces. 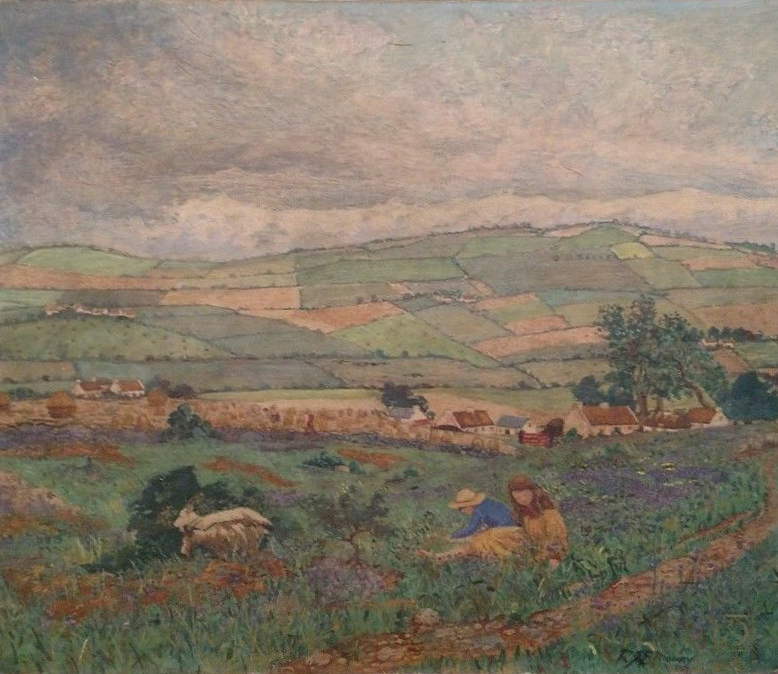 “Cornish Countryside” was a recent gift from the many friends of Seamus Tierney. ¹ The Enraght Moony family were part of Ireland’s “Landed Gentry” from its 19th century connection with the United Kingdom. Though Robert James spent most of his professional life in Cornwall, we presume he maintained his Irish citizenship. It’s also interesting to note that other members of the family emigrated to the United States: there is an R. G. Enraght Moony living in Pennsylvania, manager of the Snow Crest Poultry Farm near Scranton. You can’t make this stuff up.